​dogs do not come to class. "Very informative, like the hands-on practice!" "Teacher was entertaining and knowledgeable." "Angela was super informative and created a great environment!" "I enjoyed doing CPR on the dog manikins." Dogsafe®​ courses are designed to make complex topics easy and everyone will learn through seeing, listening, moving and doing which improves knowledge retention. This means that you not only learn topics on course day, but retain the information for the future when you'll need it. Effective, but fun too! 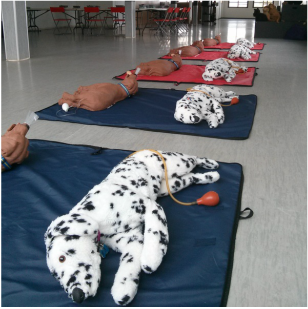 Dogsafe® Canine First Aid Authorized Instructors have invested in your canine first aid education by providing canine CPR manikin(s). Canine CPR manikins are a vital educational tool that are considerably more life-like than practicing on stuffed toys. Our manikins have working pulse and lungs enabling you to actually perform canine CPR, a technique that is not safe to conduct on live dogs. ​The Dogsafe®​ course goes beyond just watching an instructor demonstrate CPR and provides opportunities for hands-on practice with canine CPR manikin(s) -- an essential component to effective learning. "The practice dummies allowed each of us to perfect the techniques we learned throughout the day. Videos, step-by-step pictures, notes and demonstrations made her class stand out against others I've taken in the past." ​Upon successful completion, you will be granted a frame-ready 8 1/2" x 11" certificate that you can be proud to show your family, clients, and of course, your dog! ​Our name is recognized and respected as the leader in canine first aid and safety training and you'll be able to proudly display the Dogsafe® Certified logo on your company website, brochures and business cards.